There is so much that is offensive about this worksheet that I’m not sure where to begin. 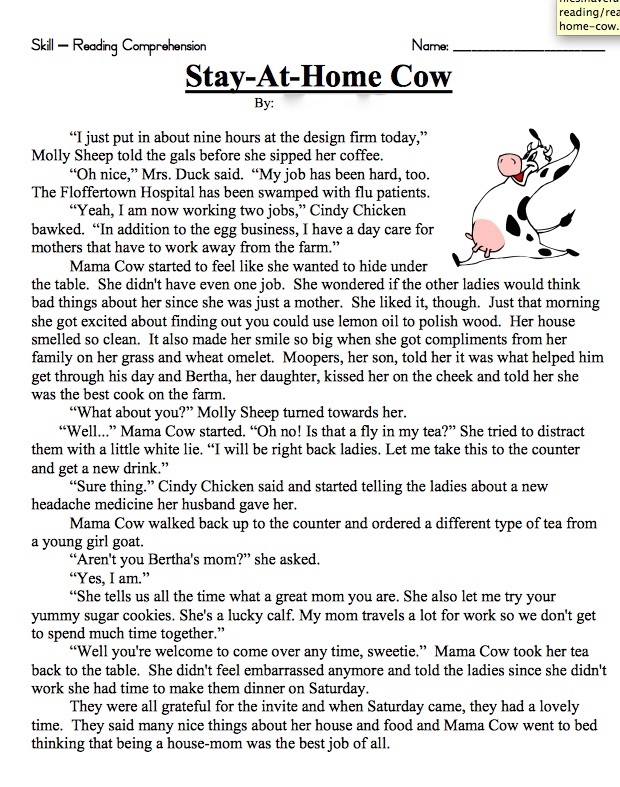 Why don’t we start with the title of the story itself: “Stay-At-Home-Cow.” Tell me, what seven year-old cares to read about the self-esteem issues of a mom-cow who feels insecure about her career of choice? What are we going to have the students read next–a poem about a dad-moose who can’t for the life of him balance the G-D checkbook? COME ON. Mama Cow started to feel like she wanted to hide under the table. She didn’t have even one job. She wondered if the other ladies would think bad things about her since she was just a mother. She liked it, though. Just that morning she got excited about finding out you could use lemon oil to polish wood. “Just a mother?” Do I even have to explain what is offensive about that? And “…she got excited about finding out you could use lemon oil to polish wood?” That’s like me getting excited about organizing my pantry. (Oh, wait…I do kind of get excited about that.) The POINT, though, is that the mom-cow is wasting precious pantry-organizing mind space comparing herself to her career-oriented farmhouse friends. We mom-cows have better things to do with our time than compare ourselves to other livestock! Get some confidence, sister! So now Mama Cow is a LIAR, now is she? She is seriously so down on herself that she has to fib about the freshness of her beverage in order to avoid feeling like being a stay-at-home parent is not sufficiently up to par with what her friends do for a living? OK, so you get the point. Giving kids a worksheet with such an insipid story is bad enough. Must we reinforce old, worn out female stereotypes, too? Then there’s the “assessment” element to this vapidness. The heading at the top of the worksheet says “Skill–Reading Comprehension,” but it’s not clear what about reading comprehension this is supposed to prove. That students can read a story and choose the “correct” answer among a pool of alternatives? Is that what reading is all about–or is that what achieving proficiency on reading tests is all about? Not to mention the fact that one could argue that the so-called answer to question number 3 is actually not a given. (The story does let us know that Mama Cow has made grass and wheat omelets before, but–depending on how you read the story– it does not indisputably state that she had made them that morning.) If we want our students to authentically attend to their comprehension of a text, rather than ask them questions with a certain answer in mind, what we ought to do instead is teach them how to monitor their understanding as they read and give them opportunities to talk to other readers of a shared text–things that real readers do.